Wireless Router Mode (Default) Creates an instant private wireless network and share Internet to multiple Wi-Fi devices, which is suitable for most hotel and home network. Repeater Mode Extend existing Wi-Fi, improving signal strength and maximizing coverage. Access Point Mode Creates a wireless network for Wi-Fi devices. WISP Client Router Mode Simultaneous Wireless ISP access and sharing. Client Mode (TV/Game Console) Gives wired-only devices access to an existing Wi-Fi networks. Access to Wireless standard 802.11ac with Wireless Transmission Speeds of Up to 750Mbps(2.4GHz+5GHz). 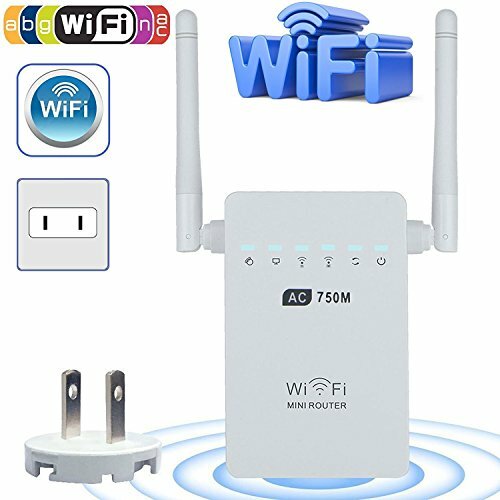 Easy to Extends the Range of your Wifi Network, No Worry about the Obstcal Weaken the Wifi Signal. Multiple Operation Modes: Wireless Router Mode, Repeater Mode, Access Point Mode, and Client Mode (TV/Game Console). With 180 degree Rotating Dual Antennas, faster and more stable. Maximum WLAN security with WEP, WPA/WPA2, WPA-PSK/WPA2-PSK. Downward complies with 802.11g (54Mbit/s) and 802.11b standard (11Mbit/s). Easy to Install and Use - Small size and wall-mounted design make it easy to deploy and move with flexibility. Supports WPS - Simply pressing WPS button to ensure the network is safe. Detachable Plug (there comes a plug for 110V applicable in the US). 1 x 750Mbps Dual Band Wifi Repeater. 1 x RJ-45 Networking Cable(1m).